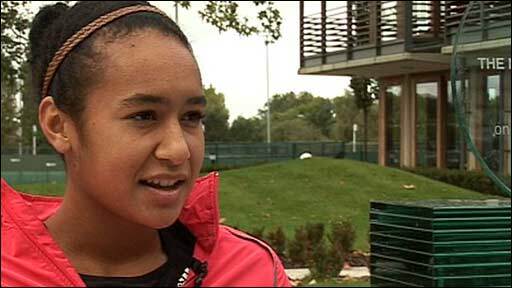 Heather Watson had only just blown out the candles on the cake for her second birthday when a British woman last won a match at the French Open. Seventeen years on, the world No 117 ended her country's long wait for a female winner when she beat France's Stephanie Foretz Gacon 7-6, 6-1 here last night. Watson, who last week became the first British woman for 28 years to reach the main draw at Roland Garros via the qualifying competition, showed all the fighting qualities that have so often been lacking in her compatriots in the past. In the second round she will play Estonia's Kaia Kanepi, the world No 16 and a quarter-finalist here in 2008 and last year at Wimbledon. Clare Wood was the last British woman to win a match in the main draw at this tournament, beating Gigi Fernandez in 1994. It was perhaps appropriate that the British drought should be ended by a player born closer to France than most. Watson hails from Guernsey, though she has been based at Nick Bollettieri's academy in Florida since the age of 12. Watson, who celebrated her 19th birthday last week, won the US Open junior title two years ago and has since been making steady progress on the senior tour. This victory should take her ahead of schedule into the world's top 100, which had originally been her target for the end of the summer. Currently British No 3, she could also be her country's highest ranked player soon. Elena Baltacha, the world No 83, plays her first-round match here today against the American Sloane Stephens, while Anne Keothavong, the No 108, lost to Russia's Vesna Dolonts yesterday. "I'm so happy," Watson said after her win. "I came off court and was asked what time I wanted to go to my press conference. I had no idea what she was saying because I was so in Happy Land." Although Foretz Gacon has gone beyond the second round of a Grand Slam tournament only once, the 30-year-old Parisian, ranked No 133 in the world, has plenty of experience. This was her 13th successive appearance in the main draw here. Watson had only ever played one match at a Grand Slam event, losing in the first round at Wimbledon last summer. The match was played on a gloriously sunny evening on Court Six, which stands a few metres from Court Philippe-Chatrier, the main show court. It is not the easiest of courts on which to play. The busy Boulevard d'Auteuil runs beyond one end, while there is a steady flow of human traffic around two other sides of the court, which is just off the main thoroughfare. The sound of wheelie bins being dragged along a path behind the back of the court hardly helps players to concentrate. Foretz Gacon broke in the opening game and twice served for the first set. Watson, who could not match her opponent's firepower but covered every inch of the court, saved three set points at 6-5 and two more in the tie-break. From 6-4 down the Briton won four points in succession, clinching the set with a lovely cross-court winner. Watson raced into a 5-0 lead in the second set, but then dropped her serve with three double faults when serving for the match. The Briton failed to take her first three match points, but on the third Forezt Gacon hit a forehand long. Asked how she had kept her nerve, Watson said: "I just thought I had to keep hitting the ball. If I started to push and be tentative and not believe in my shots, there was no chance I was going to win. These girls at this level just don't give it to you. I just stayed calm and said to myself that I would keep fighting for every single point."